I think that must have missed the memo that dropped the bombshell about this run of Luke Cage coming to an end, as the first I heard about was when I read David F. Walker’s epilogue. Finding out that there wasn’t going to be any more Walker authored Cage in my immediate future and that this was it, at least for now anyway, left me feeling like someone had just slapped a marshmallow covered churro out of my hand, then jumped up and down on my sugary treat before kicking it across the street and watching it come to rest next to a four day old, baked in the sun, crusty dog egg. As four colour news goes, I’ve had far better and reading it didn’t exactly brighten my day, because for my money David F. Walker is one of Marvel’s top tier talents and his name on a cover is enough to sell me on a book any day of the week and twice on Sunday. So when his name started appearing on the cover of Luke Cage, that was like someone had knocked on my door and when I answered it, had handed me three cases of Victory Golden Monkey while telling me “It’s on the house”. Yeah, it was good. And so was this book. Caged! 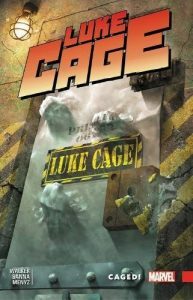 finds Luke curtailed by an old adversary and locked up in gaol and away from his family while taking a brief vacation to catch his breath before heading back to New York City. Like most things in life, Luke’s misfortune boils down to being in the wrong place at the wrong time and becoming involuntarily caught up in the machinations of a second tier villain who, having accidentally stumbled across a way of exponentially increasing his powers, is consumed by dreams of grandeur. But with Luke arriving on the scene, the would-be-king of all that he surveys has to chop and change his plans and last minute alterations, well they’re always the things that let you down and before the villain of the piece can tell the world how much he hates the phrase “Sweet Christmas”, Luke steps up to the plate and saves the day the only way he knows how. By cracking skulls and bringing the whole shebang down around the supervillains incredibly large head. That’s not all though boys and girls, because just when you think it’s over, Walker and his dynamic artistic duo, Sanna and Menyz, who gave Luke Cage its unique breath-taking sense of identity , throw a curveball your way and end the book the way it was meant to ended, with a touching, heart felt tale of what it means to be a parent and the eternal and unbreakable bond that exists between fathers and daughters everywhere.